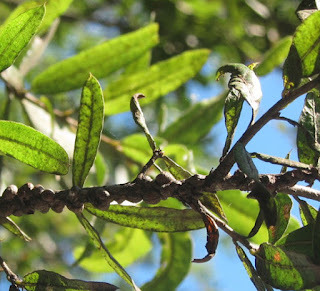 Restore Mass Ave announced today that it has treated the willow oaks on historic Embassy Row infected by a pest called oak lecanium scale (Parthenolecanium quercifix). 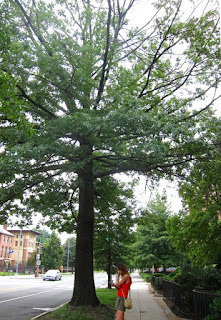 But other willow oaks along DC streets are suffering badly from this pest. This warning was issued today by the manager of RMA's project, William Eck of Bartlett Tree Expert Company in Gaithersburg, Md. Though this scale has been known a long time, Eck warns that it is getting worse. Damaged pin oak, 2500 block of Mass Ave.
Eck, who is an arborist and manager for Bartlett, said some of the badly infected trees are majestic willow oaks along MacArthur Boulevard, Lowell Street and Loughboro Road and 46th Street in Northwest. Eck also reports bad scale damage to these iconic trees on M Street and nearby streets in Southeast. Many of these large, majestic willow oaks are city "street trees." In today's press release with Eck's warning, Restore Mass Ave called on the DC Urban Forestry Administration, which has charge of the city's 131,000 street trees, to inform the public whether the threat from oak lecanium scale is getting worse. In the past, this well-known scale tended to fade away each season so treatment was not needed. Residents and businesses should look for signs of scale on the willow and pin oaks (see RMA photo). RMA President Deborah Shapley urged the public "to consider treatment for less damaged and nearby undamaged trees." The scale spreads from tree to tree and does not respect boundaries between city-owned street trees and privately maintained trees nearby. Oak lecanium scales along twig of a Mass Ave willow oak. 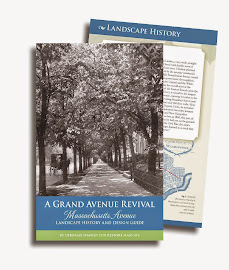 After Eck /Bartlett identified the scale as damaging or about to damage twelve trees in the 2500 block of Mass Ave, RMA hired the firm to treat the trees; some were city trees, and some were second row trees facing them across the sidewalk. Go to our Second Row of Trees page for more on our project which could be a model for public-private response to the threat. Nearly all of the hundreds of trees along the Embassy Row part of Massachusetts Avenue NW are lindens or elms. RMA has also arranged swamp white oaks (Quercus bicolor) which is in a sub-genus of the oak family that this pest does not care about. Fortunately, just twelve willow oaks and pin oaks were judged at risk. For more info and a photo of our worst damaged tree please visit our Green Your Street page. Eck says watering and mulching are the best way to prevent the scale from hurting these trees. When they grow healthy and strong, they can resist these pests.